Algal blooms are a global problem due to various negative effects that can compromise water quality, such as the production of metabolites that are responsible for odour, colour, taste and toxins. In drinking water supplies algae can reduce the aesthetics of potable water when not readily removed by conventional water treatment processes. One of the major challenges in water treatment is the removal of cells without leading to lysis and the consequent release of dissolved metabolites in the water. The Maestra Reservoir, which is located in Caxias do Sul, RS - Brazil, is a small meso- to supereutrophic reservoir. The reservoir provides water for the Celeste Gobatto water treatment plant (Celeste Gobatto WTP) which uses the conventional method of treatment. This study aimed to evaluate the efficacy of conventional water treatment for the removal of algae, cyanobacteria and cyanotoxins. A bloom of Microcystis (Kützing) ex Lemmermann with a density of 23 163 cells-mL-1, Ceratium furcoides (Levander) Langhans, (5 356 cells-mL-1) and a microcystin concentration of 1.97 μg∙L-1was found in the raw water reservoir. Samples sites were assigned the following numbers: (1) raw reservoir water; (2) WTP entry; (3) after sedimentation; (4) filtered water; and (5) treated water. Cell removal was evaluated by cell counting conducted with an inverted microscope, chlorophyll-a by a colorimetric method and microcystin by an enzyme immunoassay kit. Conventional water treatment was effective in removing chlorophyll-a, Microcystis sp. and Ceratium furcoides, mainly in the early treatment steps. Microcystin persisted until the last treatment step, when approximately 50% of the microcystin that had arrived at the WTP was removed by disinfection. Removal of these taxa and toxin was above 98%. Despite the efficacy of Ceratium furcoides removal, the presence of this dinoflagellate in treated water is considered to be large because of its large size. Cyanobacteria, which produce odours, colours, tastes and cyanotoxins, often occur in water reservoirs used for public water supplies (Becker et al., 2010; Zamyadi et al., 2015; Szlag et al., 2015; Mohamed et al., 2015; Su et al., 2015). These blooms are a challenge for water treatment because it is difficult to remove the cells without leading to lysis and the consequent release of dissolved cyanotoxins in the water (Pietsch et al., 2002). The Brazilian Ministry of Health (MS) regulates the monitoring and quality control of water in reservoirs that have blooms of cyanotoxin-producing organisms (Ordinance 2914, 2011). Determinations are made under the Guidelines of the World Health Organization (WHO, 2011), which defines the limit for microcystin-LR as 1 μg·L-1. Ewerts et al., 2013) and water treatment efficacy, reducing coagulation, sedimentation and longevity of the filters (Ewerts et al., 2013; Van der Walt, 2011). In Brazil, many water treatment plants (WTPs) are supplied by surficial water sources and use conventional water treatment (National Water Agency, 2010) that removes cells and cyanotoxins through chemical and physical processes of clarification (coagulation, flocculation and sedimentation), filtration and disinfection (Chorus and Bartram, 1999). However, studies have shown that the removal rate of cells and cyanotoxins is variable and influenced by treatment conditions and by the phytoplankton species present in the water (De Julio et al., 2010; Zamyadi et al, 2012). Although conventional water treatment is often effective for producing drinking water, the use of advanced techniques may be necessary if phytoplankton blooms, cyanotoxins or other organic compounds are observed, such as activated carbon, nanofiltration and UV radiation combined with oxidising agents (Bandala et al., 2004; Ho et al., 2009; Liu et al., 2010; Camacho et al., 2013). Although these technologies are effective, they are not always feasible for WTPs because of the increased treatment costs (Oliveira et al., 2006). This work aims to evaluate the efficacy of conventional water treatment for the removal of algae, cyanobacteria and cyanotoxins in a full-scale plant at Maestra Reservoir and Celeste Gobatto Water Treatment Plant (WTP) in Caxias do Sul, Rio Grande do Sul, Brazil. The water supply of Caxias do Sul is obtained from surfi-cial water bodies with slow discharge, such as the Maestra Reservoir (Fig. 1). The reservoir, which is located in a humid subtropical region (Cfb, according to Köppen-Geiger, 2011) was built in 1968 and has a maximum depth of 31.9 m. Its trophic state at the time of this study varied between various meso-supereutrophic states (Carlson, 1977 modified by Lamparelli, 2004), as indicated by total P and chlorophyll-a. The area of the basin that supplies the reservoir is 15 km2 and the volume is 5.4 x 106 m3. The reservoir can supply 22% of the water needs of the population of Caxias do Sul. The collected water is treated by Celeste Gobatto WTP, which uses conventional treatment with aluminium sulphate as a coagulant and chlorine compounds for disinfection. During the collection period the chemical dosages were 34 mg-L -1 of aluminium sulphate and 1.25 mg-L -1 of chlorine. The analysis of total trih-alomethanes and residual chlorine were performed by a Hach DR 890 colorimeter according to Standard Methods (APHA/ AWWA/WEF, 1999). Sample collection for evaluating the effectiveness of water treatment in removing phytoplankton (algae and cyanobacte-ria) and cyanotoxins was conducted on 2 and 3 January 2013. 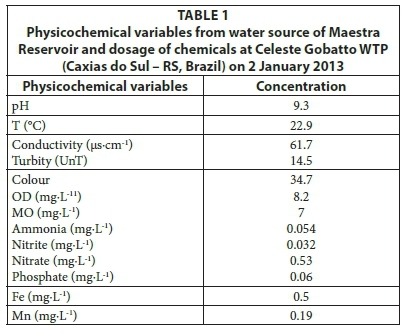 Surficial water was collected for analysis of physicochemical variables (Table 1). Triplicate samples were collected from surficial water and from the capitation point at gates/pipes that simultaneously collect water at 4 and 9 m depth in the reservoir and at each treatment step for analysis of chlorophyll-a, enumeration, and identification of phytoplankton and cyanotoxin (saxitoxins and microcystins). The sampling sites were assigned the following numbers: (1) raw water; (2) WTP entry; (3) after sedimentation; (4) filtered water; and (5) treated water. The same analyses were conducted on the backwash of the water filters. The effectiveness of the water treatment was evaluated by the difference between two subsequent measurements, e.g., the effectiveness of the filtration process was evaluated by the difference between 'filtered water' (4) and 'after sedimentation' (3). Samples of 500 mL were collected and filtered in GF-3 filter (Macharey-Nagel, German). Chlorophyll-a extraction was performed after addition of 10 mL 99.8% methanol, for 24 h at -20°C and with the sample kept in the dark. After being centri-fuged at 6 000 r-min-1 for 15 min, the samples were analysed at 665-750 nm. Absorbance results were converted to μg∙L-1 Chl-a according to Mackinney (1941). The samples for phytoplankton analysis (identification and enumeration) were obtained from 5 L of sampled water, concentrated in 22 μm mesh filters. The filters were stored in amber flasks with 50 mL of 4% Lugol's iodine. The identification of the phytoplankton to genus and species level was based on specialized references and keys elaborated by Bicudo and Menezes (2006), Komárek and Anagnostidis (1998) and Cavalcante et al. (2013). Identification and enumeration were conducted with an inverted microscope, ZEISS AXIO VERT A1 (Göttingen, Germany) with a coupled photographic camera, using a 2 mL sedimentation Utermöhl chamber (Flemming, Brazil) and 400X magnification (Edler and Elbrachter, 2010). The presence of saxitoxins was evaluated with high performance liquid chromatography (Shimadzu, Japan), equipped with a quaternary pump model LC-20AD, gradient elution system, fluorescence detector (FLD) RF-10XL, acquisition system 'Lab Solutions software' and 150 μL injection volume. The saxitoxin variants (Neo-STX, dc-STX and STX) and gonyautoxin (GTX 1-5) were analysed according to the methods described by Rourke et al. (2008) and validated by Kolb (2012). The microcystins were analysed with the immunoassay kit Envirologix (USA), with a detection curve from 0.16 to 2.5 μg∙L-1 (Chu et al., 1989) and read with a Thermo Plate reader under absorbance mode, with 450 and 540 nm wavelengths. For the study evaluation, all samples and standard curves were submitted to the protocol assay for microcystin detection. Removal of phytoplankton, chlorophyll-a and cyanotoxins were evaluated using a one-way ANOVA and Fisher LSD post-hoc test (p < 0.05). A bloom of Microcystis sp., with a density of 23 153 cells-mL-1, co-occurring with Ceratium furcoides (5 356 cells-mL-1), was found in the raw water of the Maestra Reservoir (Fig. 1). The raw water contained almost 2 μg∙L-1 of microcystin. The chromato-gram of the saxitoxin analyses showed none of the standard variants in the samples. However, a peak was observed that did not correspond to any of the analysed toxins. This peak was found only in raw water and not in any other treatment steps. The results of microcystin, chlorophyll-a and cellular removal at each treatment step are shown in Table 2. The removal efficacy was 99.11% for Ceratium furcoides and > 99.84% for Microcystis sp., which represents a removal of 48 and 1.97 cells-mL-1, respectively, at the end of the treatment. Chlorophyll-a removal was 98.12%, and microcystin removal was 99.99%. For all variables analysed, the biomass decrease occurred during the early steps (Fig. 2), and was mainly due to the selection of an appropriate depth for water collection which avoided the relevant bloom depth. The highest removal that occurred within the water treatment process was due to coagulation/floc-culation that occurs between Steps 2 and 3, and is responsible for water clarification. 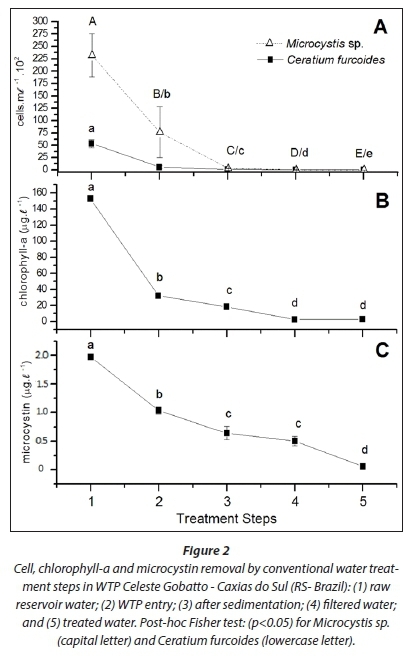 The filtration step (Step 4) was associated with a significant reduction in the number of cells and the amount of chlorophyll-a; Step 5, after the addition of chlorine, was associated with removal of microcystin and cells. The residual chlorine in the treated water ranged from 0.89 mg-L-1 to 0.95 mg-L-1 during the two days of the experiment. Furthermore, concentrations of total trihalomethanes were 0.011 mg-L-1 in December and 0.018 mg-L-1 in March. and Bellinger, 1992; Van Ginkel et al., 2001; Naselli-Flores and Barone, 2003; Hedger et al., 2004; Matsumura-Tundisi et al., 2010). In addition, C. furcoides cell counts were high compared with Brazilian records of counts that were typically below 30 ind-mL-1 (Santos-Wisniewski et al., 2007; Silva et al., 2012; Cavalcante et al., 2013). The Microcystis sp. cell counts, of above 20 000 cells-mL1, made the analysis of cyanotoxins in raw and treated water obligatory, according to Brazilian regulations (Ordinance 2914, 2011). The microcystin concentration in the raw water was almost 2 μg-L-1 higher than the maximum accepted value for treated water (1 μg-L-1). Therefore, effectiveness of toxin removal by conventional water treatment was essential to ensuring that the water supply was fit for human consumption. The initial removal of cyanotoxins, chlorophyll-a and cells occurred during a purely physical process due to the collection of water at gates located at depths of 4 and 9 m in the reservoir. At these depths a reduction of 89% (relative to average concentrations within the source water) was achieved for Ceratium sp. and a reduction of 66% for Microcystis sp. Online monitoring and the practice of collecting water at different depths, according to bloom depth, is applied by WTP operators to prevent the breakthrough of cells in the plant, especially for species able to migrate vertically, such as Ceratium spp. and Microcystis sp. (Walsby, 1992; Reynolds et al., 2002). Avoiding cell intake to the plant contributes to cost reduction, as several chemicals are needed for cell removal, and makes water treatment more effective. The clarification step (coagulation, flocculation and sedimentation) was also important for removal of cells, chlorophyll-a and cyanotoxins, as can be seen in Table 2. Microcystis sp. and microcystin were removed well by this step, with removals of 31% and 21%, respectively. Although Ceratium spp. removal was significant, it was less than 10% by the end of the clarification step, confirming the observation of Ewerts et al. (2014) that aluminium sulphate is not an effective coagulant. Though Chow et al. (1999) and Jurczak et al. (2005) have found that coagulation with aluminium sulphate and filtration do not cause cellular lysis, in this study the coagulation step may have increased the level of dissolved microcystin in the water treatment system (measured as extracellular microcystin that remained in the water after sedimentation), while the Microcystis sp. cell count was reduced to less than 2% of the total found in the raw water. According to Drikas et al. (2001) and Pietsch et al. (2002), cell lysis may be caused by mechanical damage due to the turbulence and pressure in the pipes, feed tanks and filters during treatment. Lysis can also result from unfavourable environmental conditions or bloom senescence, causing the release of extracellular toxins into the water (Znachor et al., 2006). The filtration step was effective in removing Microcystis sp. and Ceratium sp. cells; however, microcystin removal was only 0.14 μg·L-1, which is low when compared to removal achieved by other treatment steps. After filtration approx. 0.5 μg·L-1 of microcystin remained in the water (Table 2). This is likely to be extracellular microcystin, as a high rate of cell removal occurred until the filtration step (> 99% of Microcystis sp.). Consistent with these results, Hoeger et al. (2005) found that while the coagulation and filtration steps removed approximately 99% of Microcystis sp., cell lysis during the coagulation and filtration steps increased the load of dissolved microcystin which needs to be removed in later steps. The disinfection achieved by the last treatment step, adding 1.25 mg-L-1 of chlorine, was effective in removing the remaining Microcystis sp. (82%) and the total remaining microcystin. According to Lin et al. (2009) and Zamyadi et al. (2012) the response of cyanobacteria species to chlorination is influenced by the physiological state of the cells, cell densities and cyano-bacteria species, water matrix and the chlorination conditions. At higher densities of cyanobacteria, such as 5.7 x 105 cells-mL-1, chlorine doses of 3-5 mg-L-1 lead to cell membrane damage and partial toxin degradation (Daly et al., 2007; Zamyadi et al., 2010; Fan et al. 2013; Fan et al., 2014). Although the removal of C. furcoides was over 99%, 54 cells-mL-1 were found in treated water due to cell accumulation in pipes and in the water tanks of Celeste Gobatto WTP. Given the large size of the dinoflagellate, this translated to a high density of algal biomass. The lower rate of removal during conventional treatment is related to cell density, surficial charge, morphology and motility of the dinoflagellate, which decrease the effectiveness of the sedimentation process during water treatment (Cavalcante et al., 2013; Gil et al., 2012; Henderson et al., 2008). Despite an increase in C. furcoides after chlorination, a significant increase in chlorophyll-a (p > 0.05) was not found, which suggests cell inactivation by chlorine. The addition of chlorine before conventional treatment is among the studied alternatives for removal of Ceratium sp. (Van der Walt, 2011). However, according to Ho et al. (2013), pre-chlorination increases cell lysis and, consequently, the load of undesirable odour and taste compounds dissolved in the water. These risks extend to release of cyanotoxins when toxic cyanobacteria and Ceratium sp. co-occur, as in the current study. Additionally, in a recent study Ewerts et al. (2014) showed that calcium hydroxide as coagulant is more effective than aluminium sulphate for removing motile Ceratium sp. and other phytoplankton species, due to the pH adjustment that immobilizes and inactivates cells. In Brazil, the application of chlorine compounds in water supplies for human consumption is regulated by the Brazilian drinking water norm (Ordinance 2914, 2011, from Ministry of Health), which defines the quality standards for drinking water. In the present study, residual chlorine (0.89-0.95 mg·L-1) and trihalomethanes (0.011-0.018 mg·L-1) were in accordance with the standards set by the Brazilian ordinance (0.2-2 mg-L-1 and 0.1 mg·L-1, respectively) Keeping these levels within the standard ranges is essential to ensuring drinking water quality once the chlorine has associated with organic compounds such as chlorophyll and other algal and bacterial compounds, which at high levels can result in the production of toxic by-products such as carcinogenic trihalomethanes (Acero et al., 2005; Zamyadi et al., 2010; Fan et al., 2014). Although it is not a stated problem in the study site, breakthrough of Ceratium furcoides to the treated water could be a challenge to maintaining water quality within the Brazilian quality standards. The occurrence of Ceratium sp. 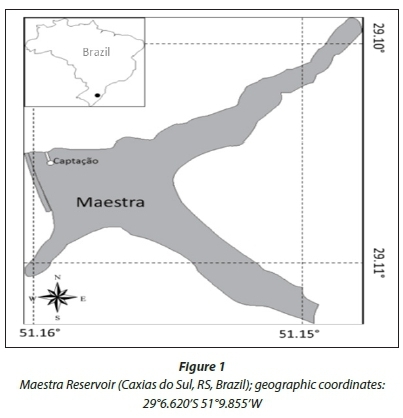 is recent in Brazilian water supply reservoirs (Santos-Wisniewski et al., 2007; Matsumura-Tundisi et al., 2010; Oliveira et al., 2011; Silva et al., 2012; Cavalcante et al., 2013). Although there are no records about the production of toxins, there are some registers about taste and odour compounds (Hart and Wragg, 2009) and the occurrence has been linked to a decrease in water quality and some problems in water treatment, such as coagulation, sedimentation and reduced life of the filters (Ewerts et al., 2013; Van der Walt, 2011; Hart and Wagg, 2009). Co-occurrence of Ceratium sp. and toxic cyanobacteria has become a challenge in drinking water treatment plants. Therefore, more studies are needed to optimize the removal of these organisms and maintain the quality of drinking water at the required standard. • The depth of water collection is important for decreasing phytoplankton, chlorophyll-a and intracellular microcystin. • Microcystin removal is effective (above 99%). However, this toxin persisted until the last treatment step, when approximately 50% of the microcystin that had arrived at the WTP was removed by disinfection. Despite the effectiveness of Ceratium furcoides removal, the presence of 40 cells∙mL-1 in treated water is considered to be high because of the large size of the cells. The authors are grateful for support from the employees of SAMAE - Caxias do Sul and for logistical support from the Universidade Federal do Rio Grande (FURG). We also thank Luciana de S Cardoso (UFRGS-Brazil) and Vanessa Becker (UFRN-Brazil) for dinoflagellate identification and Ana Maria V Azambuja (FURG-Brazil) for statistical assistance. Joäo S Yunes is grateful to FUNASA for research grant 387/2011.